Mk2RS+R32 wrote: Thanks Leon. I googled what a Zenerdiode looks like, and as you say it's the clear orange and black thing which is below the "this" I marked. It's second inline. I can take it out and solder in something else easily enough. However you've mentioned a few options. A wire, a 1 kohm resistor, a 10 kohm resistor. Which one? Just solder a wire over the zenerdiode for a test. Any markings on the IC? Solder a wire over and onto the Zenerdiode? I think the IC says 68CL09M LM2803H. It's so small I can barely read it! When the engine is running the safety switch is operating with the red light on. Never used to do this. If I then remove the tacho signal wire it turns off. So thats half way there. Only thing is, when I turn the ignition on and the engine isn't running it's still permananetly on, like a normal relay. It no longer gives that short 1 sec prime. I've just had a look at how I've soldered it and I'm wondering if the solder has gone through and onto the circuit route that runs through that zenerdiode. Effectively giving it three solder contacts. Or will this not matter? Ok. I re-wired it. Same result. I've tried pulling different wires off when the ignition is on but the engine not running, i.e. no tacho signal. Any wire pulled off other than the ground wire, i.e. the tacho signal, ignition input, power output; will stop the safety switch relay from working. Oddly pulling the ground wire does nothing except turn the LED off! So that's all weird. What now? There seems to be alot of what I would call "over complication" on this. There are 2 simple ways to do it without all the fancy little modules etc. which in my opinion is just something else to go wrong. 1. Wire it through your oil pressure switch on a changeover relay, so the fuel pump requires 2 things to operate, ignition power and oil pressure. When the engine is at running temperature the fuel pump will stop almost instantly when the engine stalls. Yes, the fuel pump won't run unless the oil pressure is up and makes it difficult to prime when starting after a period of time (eg: 2 weeks in the shed), but I never like mine to fire unless it has oil pressure anyway. If you want to be fussy fit a momentary overide switch to prime it. 2. Wire from a field wire in the alternator and ignition power to trigger the fuel pump relay. Same deal as above, it requires the alternator to be turning and igniton power for the pump to run. Same overide as above if you want to get fussy. and to ice the cake add an inertia switch and you're done. 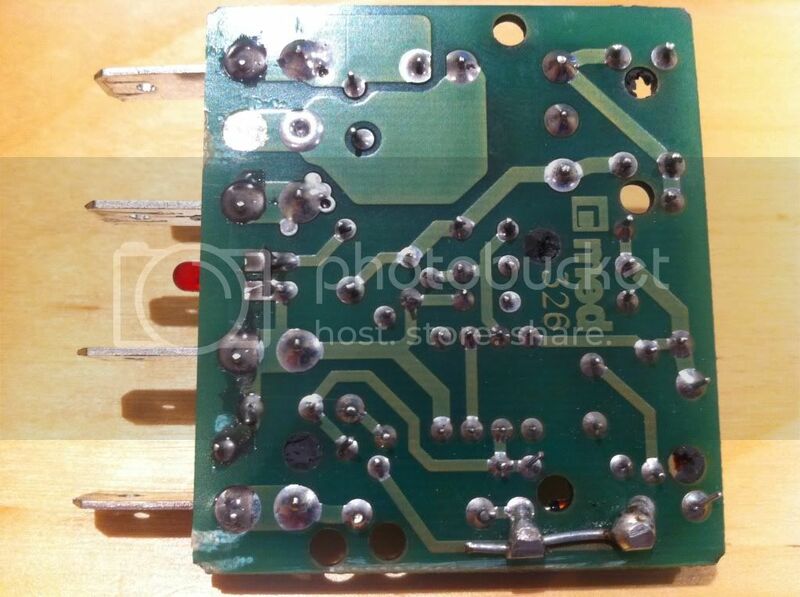 1) remove the wire you just soldered on the PCB. 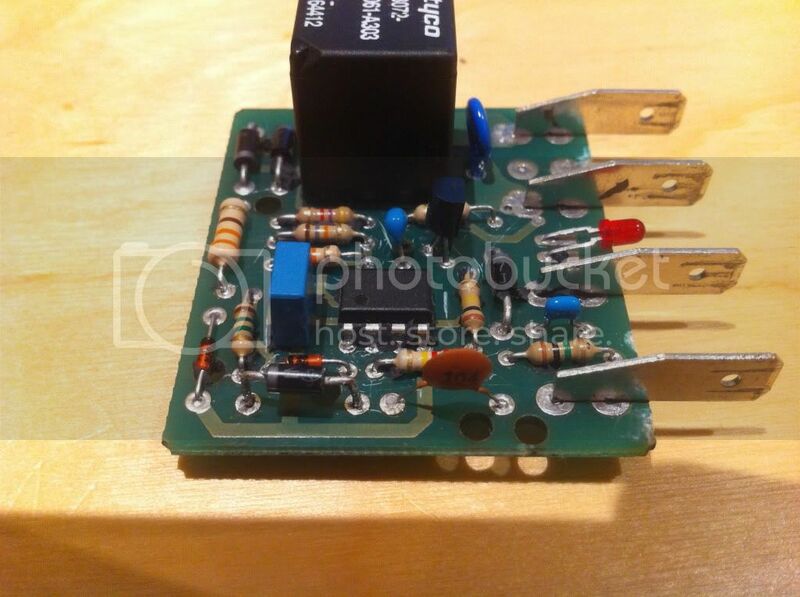 2) remove the diode mounted just in front of the zenerdiode (it's the component you marked 'this'). 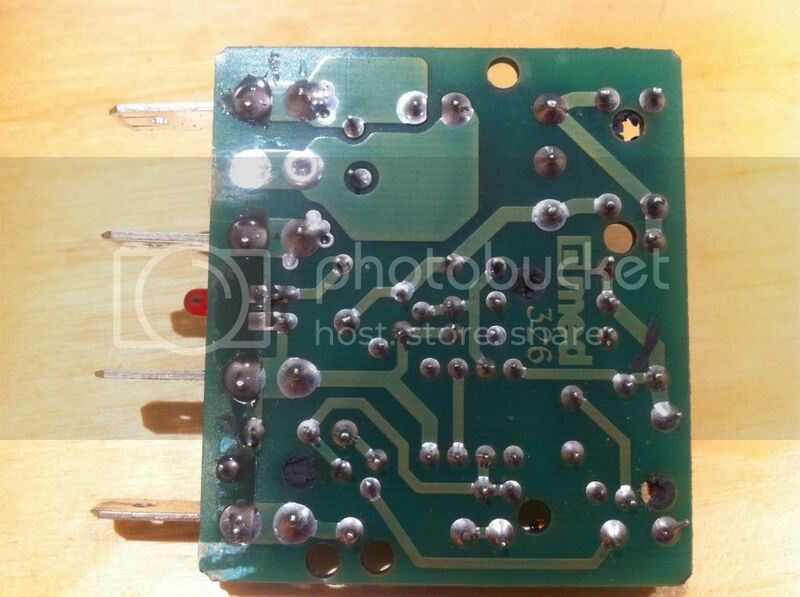 3) solder that diode in the place where the zenerdiode was. 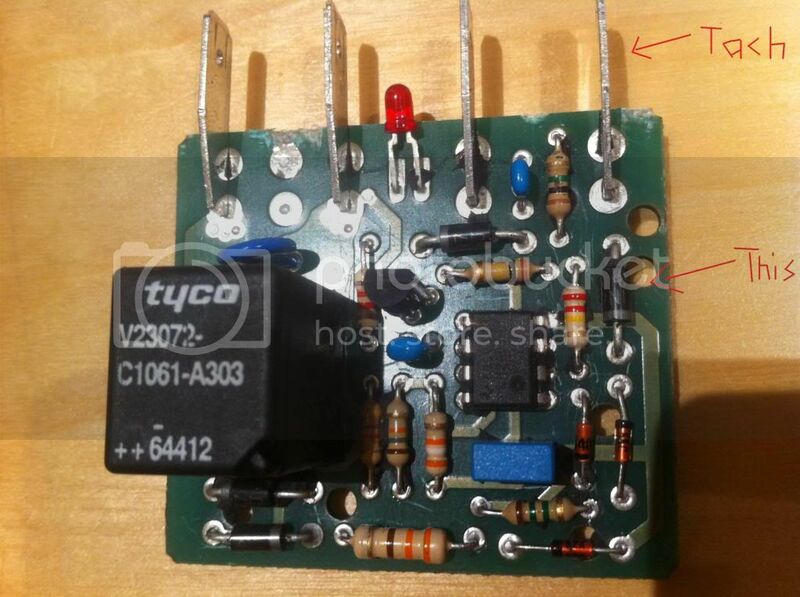 4) get a capacitor which is similar to the blue one which is next to the IC. Value should be 47 nF or 100 nF or 150 nF; anything is that region will do. Solder this new capacitor in the pace where the diode was (directly after the input pin). 5) get a resistor of 10 kOhm or a bit less and solder one end to the little track where originally the zenderdiode and the diode were connected to eachother. And solder the other end to a PCB track which is directly connected to earth. (pin 4 of the IC for example). 6) report back here with the results! You mention to remove the first diode before the Zenerdiode and then say put it where the Zenerdiode was. I take it you want me to permanently remove the Zenerdiode? Mk2RS+R32 wrote: You mention to remove the first diode before the Zenerdiode and then say put it where the Zenerdiode was. I take it you want me to permanently remove the Zenerdiode? The zenerdiode only lets the high voltage spikes from the coil through. But you only have +12V pulses so the zener must go. 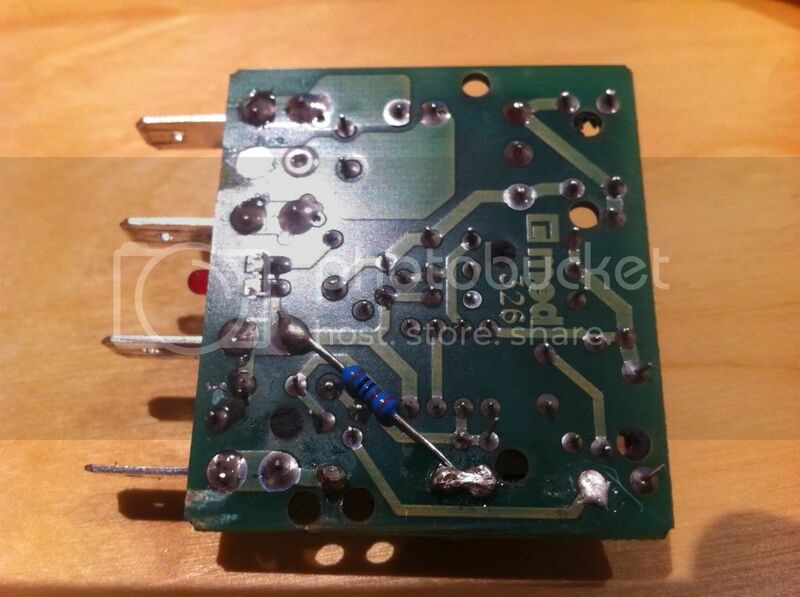 The extra capacitor/resistor combination makes spikes from the +12V pulses. No +12V pulses (as when ignition on but engine not running) will mean no spikes i.e. relay will not work. Hey thanks Miniliteman. You are indeed da man! Whilst I appreciate the many other recomendations on methods of doing this, I prefer this because it's all automatic, it pre-primes, it's simple and works on an engine rotating tacho signal and... it's cheap! And it will be great when it fails and your at a race track and can't get bits to fix it!! An oil pressure switch could fail too could it not????? Thanks for your reply Warren. As Mk1_Oz mentions, the other options suggested could fail as well. In fact anything can "fail." You mention parts won't be easily available. Well I don't know who would have what lying around and to be honest... I wouldn't bug them to borrow it. This relay is a small solid robust piece of electrical equipment, it's much the same as any other relay..really. In fact it's so non-techincal it doesn't even come near electronic ignition/fuel injection etc etc systems all using far more advanced electronics. This is just some electronics bits, no software inside so it should work untill the solder will dry out. If it should fail take the 2 leads from the box (ignition+ and pump) and join these together with a small piece of wire and two faston-male-pins (carry that in-car). Now where can I send the invoice for giving all this advice? MK1_Oz wrote: An oil pressure switch could fail too could it not????? Absolutely, the difference being you can buy an oil pressure switch at any any auto parts shop, and it's relatively easy to diagnose as when the switch fails the light comes on. Each to there own I guess, In my opinion I just think its alot of mucking around for nothing and just something else to go wrong. Looks like a whole lot of complication and overthought to me, regardless of how simple the module is you are still adding something else to fail for no reason at all. I myself would have none of this on my own car as it's just more junk to fail!!!!! !